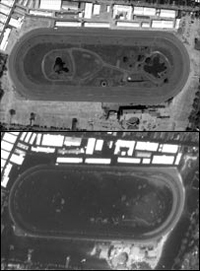 Aerial photos Fair Grounds racetrack before (top) and after the flooding. The National Thoroughbred Racing Association (NTRA) announced today that an industry-wide effort will be undertaken to provide financial relief to members of the horse racing and breeding community who have been affected by Hurricane Katrina. The NTRA Charities – Racing to the Rescue Fund, a special division of the NTRA’s nonprofit 501 (c) (3) subsidiary NTRA Charities, has been established to receive contributions, 100 percent of which will be passed through to existing charities established to aid in recovery efforts. New York-based Bessemer Trust, an NTRA/Breeders' Cup sponsor, has agreed to establish and maintain an account for the NTRA Charities – Racing to the Rescue Fund at no cost. Contributions can be made immediately via mail to: NTRA Charities – Racing to the Rescue Fund, c/o Bessemer Trust Company N.A., attention Robert Elliott, 630 Fifth Avenue, New York, N.Y., 10111. Wire-transferred funds can be sent to Bessemer Trust Company N.A., Federal Reserve Symbol, ABA# 0260-0875-6, user name: Bessemer Trust NYC-for account NTRA Charities, Inc.-Racing to the Rescue Fund. All contributions are tax deductible. Questions regarding the fund can be directed to the NTRA's Lexington office, (800) 792-NTRA (6872). In addition, the National HBPA website (www.nationalhbpa.com) will now feature an information center through which horsemen, donors and others who wish to assist can leave e-mail messages. This will allow the National HBPA to more efficiently collect and distribute information on: donated lodging for horsemen and horses; information on how to make donations; Louisiana HBPA’s operations and updates. This will also serve to help the National HBPA link missing horsemen with the Louisiana HBPA offices. The National HBPA has also added several lines and operators to its emergency toll-free horsemen's hotline 1-866-245-1711. Information on stranded or missing horsemen will be collected and passed along to the Louisiana HBPA or other appropriate agencies. In addition, the NTRA, Churchill Downs, Inc. (owner of Fair Grounds in New Orleans), Louisiana Horsemen’s Benevolent and Protective Association (LAHBPA), Louisiana Thoroughbred Breeders Association, Thoroughbred Racing Associations (TRA) member tracks, the National Horsemen’s Benevolent and Protective Association (NHBPA), American Quarter Horse Association (AQHA), Thoroughbred Horsemen’s Association (THA), Thoroughbred Owners of California (TOC), The Jockey Club, Keeneland, Oak Tree Racing Association, Thoroughbred Owners and Breeders Association (TOBA), Television Games Network (TVG), Harness Tracks of America member racetracks, United States Trotting Association (USTA) and other industry organizations have jointly agreed to designate October 8 as a special “Racing to the Rescue Day.” Racetracks and horsemen will participate in a fundraising drive for the NTRA Charities – Racing to the Rescue Fund, and create on-site donation centers where patrons may also make contributions. On October 8, a host of important Breeders’ Cup prep races will take place at Belmont Park, Keeneland, Oak Tree at Santa Anita and elsewhere. NBC will televise a live, 90-minute program that day featuring four of these major stakes and serving as a national outlet for information surrounding the industry’s relief efforts. The NTRA also announced that the 2005 Breeders’ Cup World Thoroughbred Championships, to be run at New York’s Belmont Park, will serve as a platform to raise funds for victims of Hurricane Katrina. Jockeys, trainers, breeders and owners will be encouraged to contribute a percentage of their purse winnings on Breeders’ Cup Day to the fund. The 2001 Breeders’ Cup, also at Belmont, was used to raise funds in the aftermath of the September 11 attacks. The total economic impact of the Louisiana horse industry is $2.4 billion. Fair Grounds has some 500 full-time employees and employs more than 1,000 people during its race meeting. The Louisiana HBPA has approximately 5,000 members spread throughout the state. Combined, Louisiana, Mississippi and Alabama have a population of approximately 425,000 horses. "The racing industry is always quick to respond when tragedy strikes, and the aftermath of Hurricane Katrina has been no exception," said Churchill Downs Incorporated President and Chief Executive Officer Thomas H. Meeker. "Churchill Downs Incorporated is deeply appreciative of the assistance that we have received on behalf of our Louisiana employees who have been displaced, and we are pleased to offer our full support to the NTRA's charitable efforts. We will do everything we can to ensure the fund's success as the magnitude of this disaster continues to unfold."